In the event that there is a declaration of a major disaster, the following is an outline of VA requirements regarding loans secured by properties in areas designated by Federal authorities as a result of a natural disaster such as hurricanes, tropical storms, tornadoes, etc. When the President declares a disaster, lenders and servicers must check with the Federal Emergency Management Agency (FEMA) to obtain the specific counties and corresponding declaration dates. In addition, lenders and servicers should check with FEMA for any amendments. This information can be found on the FEMA website or by calling your local FEMA office. a. Loan Closed Prior to Disaster. Any loan closed prior to the date of the declared disaster is eligible for VA Guaranty without regard to the disaster. The “Loan Servicing and Claims” information below applies to these cases. This is to affirm that the property which is security for VA loan number _________________ has been inspected to ensure that it was either not damaged in the recently declared disaster or has been restored to its pre©disaster condition or better. I have inspected the property located at ____________________________________ and find its condition now to be acceptable to me. I understand that I will not be charged for any disasterrelated expenses and now wish to close the loan. 2) VA Loan Summary Sheet. The “Remarks” section of VA Form 26-0286, VA Loan Summary Sheet must be annotated “Lender and Veteran Disaster Certifications Enclosed.” Additionally, if local law requires the property to be inspected and approved by the local building inspection authority, a copy of the appropriate local report(s) must be provided. Neither VA nor the veteran purchaser shall bear the expense of any disaster© elated inspection or repairs. 3) Decline in Value. If there is an indication that the property, despite repairs, will be worth less at the time of loan closing than it was at the time of appraisal, then the lender must have the VA fee appraiser update the original value estimate. The payment of the appraiser’s fee for that service will be a contractual matter between the buyer and seller. If the property value has decreased, the loan amount must be reduced accordingly. 4) Employment/Income Certification. The lender should ascertain prior to closing that the veteran’s employment and income have not changed since the loan application. If at the time of closing the veteran is no longer employed or family income has been reduced, this information should be reported to VA or the automatic underwriter, as appropriate, for evaluation prior to closing the loan. a. Assistance to Homeowners. The VA encourages holders of guaranteed loans in disaster areas to extend every possible forbearance to borrowers in distress through no fault of their own. For example, title 38, Code of Federal Regulations (CFR), section 36.4311 (Prepayments) allows the reapplication of prepayments to cure or prevent a default. This means that if a borrower has been making additional principal payments over a period of years, the principal balance may be increased up to the scheduled balance and the increase applied toward regular installments. Also, 38 CFR 36.4315 (Loan modifications) allows the terms of any guaranteed loan to be modified without the prior approval of the VA if certain conditions in the regulation are satisfied. The VA encourages servicers to waive late charges on loans affected by the disaster. VAThe further requests that credit reporting be suspended for borrowers whose loans are deemed to be affected by the disaster. b. It is the loan holder’s responsibility to inspect damage to properties, counsel borrowers concerning assistance that may be available to them and provide the applicable Regional Loan Center with a report that outlines the findings and actions for each damaged property. Loan holders should contact the appropriate Regional Loan Center before consenting to an insurance adjustment where the proceeds will not be sufficient to pay the loan balance or restore the security. c. VA Bulletin for Borrowers. Please include a copy of the “VA Loan Guaranty Benefits” information below in any correspondence you send borrowers in the disaster areas. The information provided here should be beneficial to all parties involved. 2) When a foreclosure sale, the product of an insoluble default which occurred prior to the disaster, was already scheduled. The sale should be delayed only to the extent necessary to determine whether the liquidation appraisal remains accurate and for such time as it may take for the holder to obtain acceptable hazard insurance loss settlement for purposes of 38 CFR 36.4329.
d. Insurance Requirements. VA Regulations (38 CFR 36.4329) require that lenders and holders ensure that homes financed with the assistance of VA©guaranteed loans be sufficiently insured against hazards (including flooding, where appropriate). Insurance proceeds are to be applied to the restoration of the security or to the loan balance. The burden of proof is upon the loan holder to establish that no increase in VA’s ultimate liability is attributable to the failure of the holder to have the property properly insured, or to properly apply an insurance loss settlement. Holders are reminded that hazard insurance policies are not to be canceled in the event of a foreclosure sale if the property is to be conveyed to VA. The policies are to be endorsed to the Secretary of Veterans Affairs. Any case©specific Appraisal, Loan Production and/or Loan Administration issues may be directed to the appropriate Regional Loan Center. This bulletin is distributed by the Department of Veterans Affairs (VA) to provide information during major disasters. The information given below is primarily for homeowners whose loans are guaranteed by the VA. Contact your lender or servicer as soon as possible regarding your loss.You are not excused from making your regular monthly loan payments even if your home is not habitable. You should discuss forbearance or possible modification of your loan if you are unable to make your payments on time. You should also have your lender explain procedures regarding insurance loss checks and repairs to your property, payment to contractors, etc. File insurance loss claims as soon as possible; however, do not make a hasty settlement on insurance. When the property is damaged but repairable, attempt to get the engineer’s office of your local government to make an inspection for structural damage. If possible, get at least two estimates from licensed contractors for cost of repairs or rebuilding. Insurance checks for personal property and living expenses should be made payable to you only. 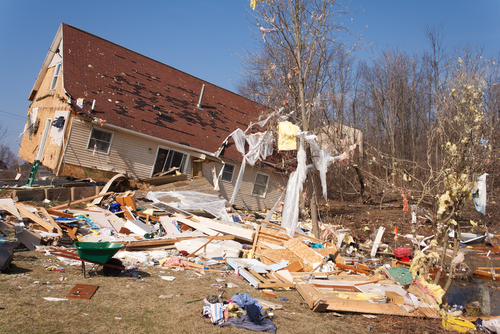 Checks for damage to your home should be made payable to you and your mortgage company. You begin the disaster application process by calling FEMA’s toll free number (800) 621©Þ2, or (800) 462©=85 (TTY). In order to receive the maximum assistance, you must register with FEMA before their deadline expires. You cannot obtain assistance for uninsured losses or damages to your home from the Small Business Administration (SBA) or any other disaster recovery agency if you have not registered with FEMA. More information can be found on the FEMA website,. Be sure to check every source for assistance including the SBA. Do not pay your loan in full before checking with SBA on a loan for the uninsured portion of your loss. Low interest loans, cash grants, and housing assistance may be available from agencies associated with the disaster recovery effort. Veterans should contact local offices of the American Legion, Veterans of Foreign Wars, Disabled American Veterans (DAV), or other veteran service organizations to see if special assistance may be available, even to non©members of the organization. If you are receiving a monthly benefit check from the VA or another source and you will not be able to receive mail at your regular address, notify your local post office and VA Regional Office of your change of address.